In a nation that represses even the most basic of human rights what can we honestly define an activist as? Is it not somebody who seeks the liberties that social media and television flaunt before them every day? Is it not a person who asks of his/her government why they cannot say or write what they wish to express to the world at large? Is it not a person who seeks the freedom to pursue their own happiness over that of the “greater good”… especially in a nation that dictates just what the greater good is? For the supporters from both the Uyghur community in China and those from the outside the definition is unclear. It isn’t until a government official ask them to “drink tea” that they realize that they are considered activist by Chinese standards. But by that time it is too late. The government has already cast its judgment. False charges are already being drawn up and indefinite detention is already a reality. For the supporters of the Uyghur in China the mere appearance of activism is a crime. After the ethnic violence in Xinjiang over the past two months the government of China has been increasing it’s military presence in the region. Paramilitary units meant to reinforce the police state have been deployed in Uyghur neighborhoods to create a permanent police presence. Curfews are imposed in areas where China’s police have deployed riot vehicles and stockpiled tear gas. This drastic response to 35 deaths in June would indicate at very least a tinge of fear on China’s part. It most certainly would instill fear on the targeted community, the Uyghurs of Western China. This response is the largest such response in four years since the 2009 riots in Urumqi. It was in that massive riot that 200 plus citizens were killed, hundreds were arrested, and an untold number were found to be missing after China deployed it’s dragnet approach to policing it’s citizens. After the Urumqi tragedy the state cut off Internet for an entire year. In addition the Uyghur, blamed by the state for the violence imposed against them, were left with a police state where constant surveillance and police harassment became the new normal. This latest round of ethnic violence in the region shows that at least on some level the Uyghur people have grown tired of being forced to work for China’s “greater good”. While the Eastern portion of China has prospered off the sweat of Uyghur youths’ brows the Uyghur people themselves have been left out of the economic growth. Their villages, their cities, and their “autonomous region” has watched as the natural resources they posses have been shipped eastward. Uyghur parents have watched as their children have been forcibly stripped of their culture and ethnic heritage. All that has been left for the Uyghur community living in China’s shadows is resentment. Now as the youth of the Uyghur community show an interest in advancing their own prosperity the state has shown it’s willingness to utilize it’s iron fist. Students who have spoken out in the most moderate of fashions have been told by Beijing’s agents in Xinjiang to go with them to “drink tea”. This is an informal way of arresting the student and forcing them to go along with the state agent. What happens next can vary in many ways. At times the student arrested can end up in official jails to be detained for crimes they clearly did not commit. At other times the state can make these “dissidents” disappear by taking arrested Uyghur “activist” to black prisons. All connection to the outside world is cut off and the student is not heard from again till the state decides to release it’s victim. For Mutellip Imin this is exactly what happened on July 15th. Imin, 24 years of age, has not been heard from yet. His cellphone has been shut off and the last message received from him was “SOS”. This strategy is just one more way China has followed the West in an unholy war on terror. 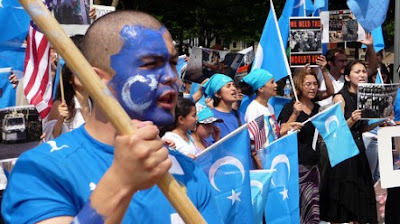 For the past decade China has been labeling Uyghur groups and individuals as “jihadist” to excuse the excesses of government officials and police agents. When China overreaches and, if for a moment, the media begins to pick up on the state’s abuses the magic word “terrorism” appears. It is China’s new method of spreading Beijing’s authority further westward as economic growth fuels ethnic cleansing. In the past four years China’s iron fist has shown the Uyghur that if they will not work as slaves for the greater good they will be expected to leave the country all together. Any that stay in their homeland are expected to accept the religious and ethnic discrimination imposed by Beijing. Those who stay are expected to work themselves to death for a country that views them as permanent outsiders. As for the West, the reality of what the Uyghur community in China faces has been covered up by the obsession with a romanticized “Arab Spring”. In our attempts to view the Middle East as “coming over to our side” or “becoming more secular” we have ignored the plight of ethnic minorities across the globe. While Egypt fights to determine it’s own fate the Uyghur people struggle to throw off a fate imposed upon them by a nation that has rejected them. While Iran toys with the notion of moderating the role of religion over the state the Uyghur have their religion banned by a state that touts it’s authority over them. And yet for the past four years we have heard little to nothing about the Uyghur people who are fighting for their dignity, their culture, and their heritage. Want to learn more about this subject or others covered by Alder's Ledge?